Interesting story in the online Gazette today that scientific investigation (oxygen isotope analysis) of the remains found at the Anglo-Saxon cemetery at Cliffsend, reveal a mix of origins, from Scandinavia to the Southern Mediterranean. 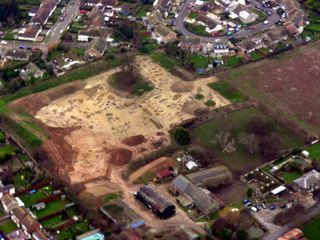 I wrote about this once before, when the position of the 'dig' was still a secret and I photographed it from the air. At first the suggestion appears to be that it was a Bronze Age site but other burials were subsequently discovered, reportedly from the post Roman period. I'm expecting delivery of a new 'big' camera body tomorrow and so, with luck, my next set of aerial photos will be even sharper than ever. I haven't changed cameras in four years and the technology and in particular, the image sensor capability, has moved-on in leaps and bounds in contrast with the picture shot in relatively low light and seen above. Presently, I'm in a battle with the BBC and their 'Good Ideas Fairy' over some aerobatic filming next month on the South coast. What aircraft can do on a storyboard and what they can achieve in reality appear to be two very different things, with a producer whose heart is set on something quite unusual, so we'll see. The other day, I had a client who asked if I might "Stop over Brighton Pier" so she "could take some photos." I replied that stopping whilst airborne isn't recommended in the aircraft operating manual and that I might have to disappoint her. The big airshow at Manston is now only two weeks away and it's looking to be an exciting spectacle. I plan to attach a couple of GoPro cameras to the aircraft and film the action from my own perspective and place the results here for you to see. Now all we need is a spell of fine weather and with two sponsor flights to do over the cricket international at Edgbaston, next Saturday, both India and Pakistan are likely hoping for the same. The beach at Westgate looks delightful but at this time of years it should have a scattering of small children wielding buckets and spades in swimsuits and not winter coats;I wouldn't recommend sitting outside in the cold north-east wind. I'm having trouble remembering a summer like it.